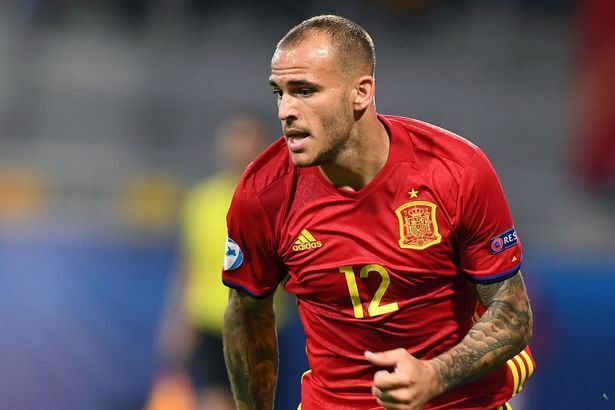 Everton are becoming increasingly frustrated at the red tape blocking their capture of Sandro Ramirez. The Blues pulled off a real coup when the Spain Under-21 international - who is regarded as his country’s next great striker - agreed to join them in a deal that will only cost a little over £5m, despite interest from the likes of Italian giants Juventus. Sandro left Barcelona because of his lack of opportunities at a club that boasted the most celebrated front three in world football in Lionel Messi, Luis Suarez and Neymar. He made it clear to Malaga that he would only stay for a year as he set about putting himself in the shop window. That is why such an attractive release clause was put into the contract of one of the most highly-rated young strikers in Europe - and Everton have now activated that clause, to trigger a transfer of just £5.3m. Club secretary David Harrison was in Poland — where Sandro is playing in the U21 Euros — to complete the transfer. But with Malaga dragging their heels, Everton are facing frustration in their attempt to deliver another big signing to their fans. The player flew to England last week to thrash out a deal and he was impressed by the vision presented by the club, with manager Ronald Koeman determined to build a squad capable of challenging for a top four place. With the clause activated, the deal will go through, but it could be some days yet before the arrangements are completed at the Spanish end.